At Rivashaa Eco Design Solutions, we specialize in LECA balls India. We are the #1 supplier for expanded clay pellets in the country – offering the best products at reasonable prices. Our clay balls are checked for quality to ensure that you always have the best materials for your project, and we have a huge variety of clay balls for sale – from tiny pellets that are only a few micrometers in diameter to expanded clay balls that are up to 30mm in diameter. 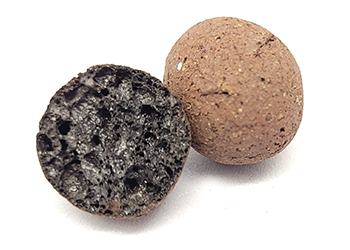 Whether you are interested in using LECA balls for construction, irrigation, water control, and management, or for any other reason, we are here to help. At Rivashaa Eco Design Solutions, we believe in making the world a better, cleaner, greener place. And through our line of expanded clay balls, we believe that we can do that. Our ECA or LECA products are manufactured in India from eco-friendly manufacturer manufactured using clean processes – and as a 100% natural material, clay is inert and not harmful to the environment. You can trust us as suppliers and the only source to deliver eco-friendly LECA balls India. Our expanded clay balls aren’t just made to be eco-friendly, either. When used in construction, they are extremely helpful when designing eco-friendly, green buildings – for example, structures that meet LEED certification requirements. LECA aggregate is a lightweight material with extremely good insulative properties, which makes it perfect for concrete structures that must maintain high energy-efficiency. This is just the tip of the iceberg when it comes to our line of expanded clay balls. Due to their thermal insulation properties, fire resistance, unique drainage properties, and hollow, lightweight construction, our LECA balls India can be used in hundreds of different applications. Learn more from our website now. At Rivashaa Eco Design Solutions, we’re proud to serve our customers with high-quality ECA and LECA products. That’s why we make it our goal to always offer guaranteed deliveries and fast shipments for your products – whether you’re in India, the United States, Canada, UK, Singapore, Australia, South Africa, UAE or anywhere else in the world. We understand how important material logistics are for a successful project – which is why we always pledge to ship our products on time and get them to you as quickly as we can. We guarantee your satisfaction with our services and our products – no matter what. If you would like to buy expanded clay balls from Rivashaa Eco Design Solutions, please contact us right away by visiting our website. We can provide you with pricing, spec sheets, and a list of our current products so that you can choose the LECA aggregate that is right for you.